Henry A. Garrido is the Executive Director of District Council 37, NYC’s largest municipal employees union with 125,000 members and nearly 50,000 retirees. DC 37 members work in mayoral agencies, public schools, city libraries, cultural institutions, the Health and Hospitals Corporation, the Metropolitan Transportation Authority, School Construction Authority, emergency medical services, the Triborough Bridge and Tunnel Authority, the Unified Court System and New York Law School. Under Garrido’s direction, the union recently ratified a 44-month collective bargaining agreement with the City of New York. Since becoming executive director in December 2014, he has focused on encouraging greater member participation and building union strength. Towards these goals, Garrido initiated DC 37’s “Union Strong” campaign, key components of which have been improving services, enhancing communication and conducting one-on-one conversations with members. Garrido served as DC 37 associate director under former ED Lillian Roberts. In that position, he helped establish the Municipal Employees Housing Program, which coordinates grants for first-time homebuyers and provides foreclosure prevention services as well as education and counseling. He also directed the union’s white paper project, which addressed city waste by investigating contracting out and identifying revenue sources. 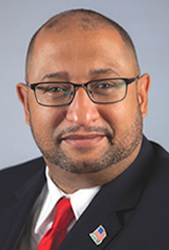 Garrido is a trustee on the city’s Workforce Investment Board, which advises the mayor on jobs and economic development, and serves on the board of the New York City Employees Retirement System (NYCERS). A native of the Dominican Republic, he is the first Latino to head DC 37 since it was formed in 1944.